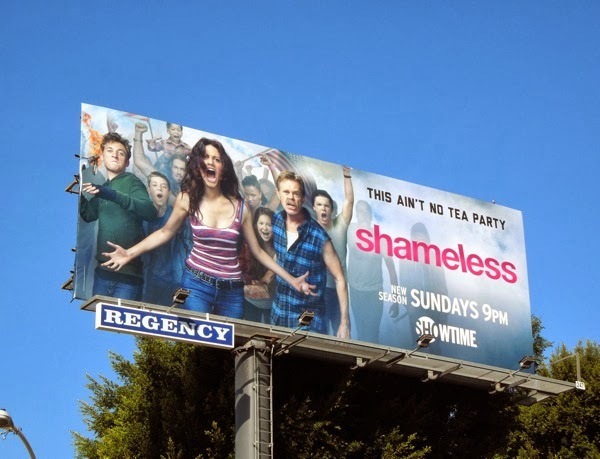 Today may be the culmination of Hollywood's prestigious awards season with the 86th annual Academy Awards ceremony at the Dolby Theatre, but one TV show which is quite possibly the furthest away from the glitz and glamour of Oscar statues and red carpets is Showtime's Shameless, which is currently airing its fourth season. This new batch of episodes are possibly some of the darkest, most dramatic and upsetting of the series to date, so you can see why The Gallaghers are looking rather revolutionary in this season four promo billboard. 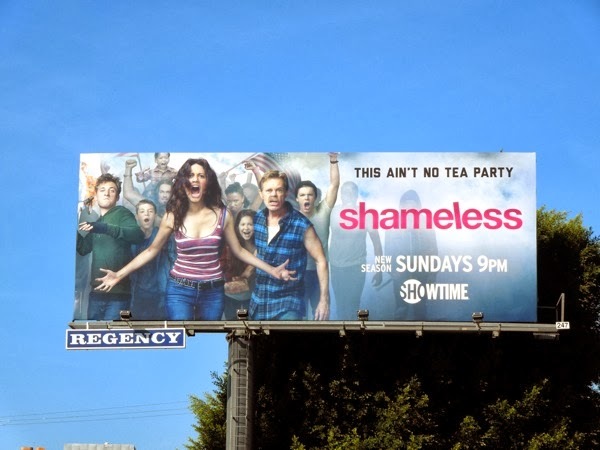 The original acclaimed U.K. show that Shameless is based on, and shares the same name with, lasted eleven seasons until it ended last May 2013. 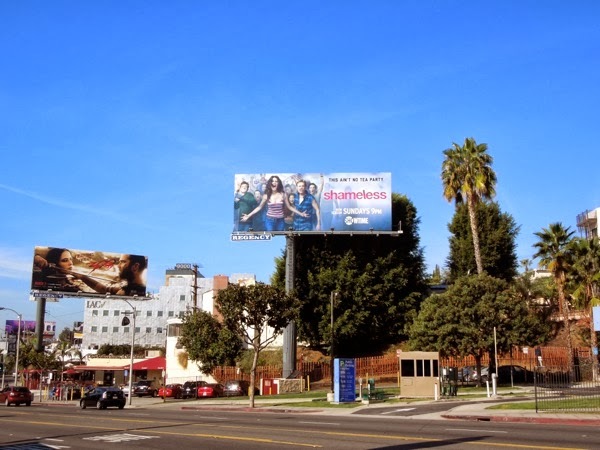 Daily Billboard wonders how long the U.S. version will survive, but as it's already been renewed for a fifth season by Showtime, William H. Macy, Emmy Rossom and the whole dysfunctional and debauched clan ain't going anywhere anytime soon. 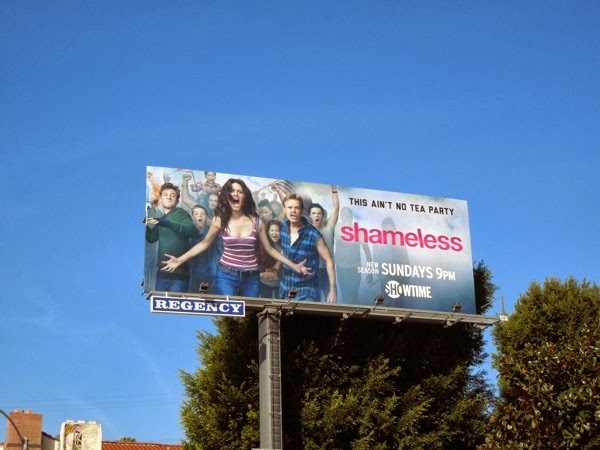 Season four's 'This ain't no tea party' ad creative was snapped along L.A.'s Sunset Boulevard on February 17, 2014. 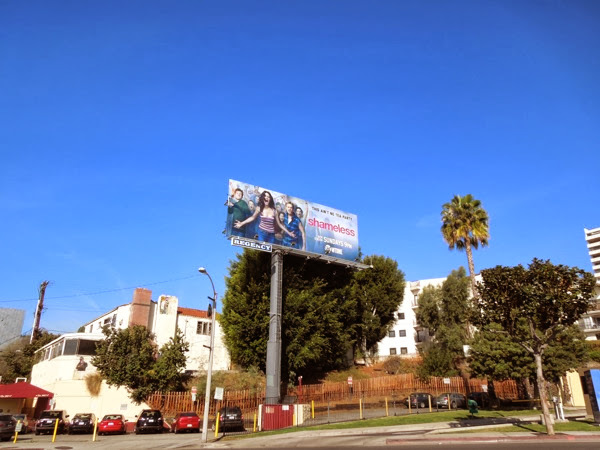 If you're a fan of the show, be sure to also check out all three previous season promo billboards for Shameless here at Daily Billboard.